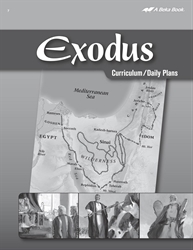 In one semester, guide your child through the background and the story of Exodus with this Curriculum. This daily guide includes a scope and sequence, grading suggestions, scheduling ideas, and 85 lessons plans. Each lesson gives prompts to study Memory Verses, say the Pledge of Allegiance, sing songs from the Exodus Sing His Praise CD, pray, and present the lesson from one of five Flash-a-Card sets. Give your child a thorough understanding of Genesis and Exodus with the Exodus Curriculum Lesson Plans.